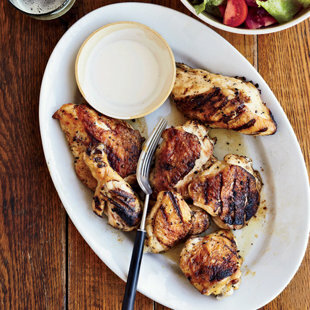 "A lot of people marinate raw food in barbecue sauce, because they're thinking, Oh, I want barbecued chicken," says grilling expert Elizabeth Karmel. The problem is that sauce often contains sugar, which burns quickly, resulting in a lackluster version of the classic dish. Here, the Hill Country Barbecue chef identifies more ways to ruin a cookout, and how to avoid those mistakes. 1. COOKING WITHOUT HEATING THE GRILL Just like you'd heat a sauté pan before you put food in it, it's very important to preheat the grill to cook any foods properly. Preheating also sterilizes the grill by burning off any residue. 2. LEAVING THE LID OPEN You would never bake a cake with the oven door open, right? Just like preheating is essential to proper cooking, so is temperature control while grilling. 3. IGNORING THE DIFFERENCE BETWEEN DIRECT AND INDIRECT HEAT I've got a couple of good rules of thumb: If something takes 20 minutes or less to cook, use direct heat. If it takes more than 20 minutes, use indirect. And if you don't know how long something takes to cook: The bigger it is, the denser it is, the heavier it is, the longer it takes. 4. INCINERATING YOUR FOOD The hotter the fire does not mean the better you'll cook your food. Most food is delicate and needs a gentle heat after you sear it. You're going to get a better result and coax the love out of the food by treating it gently and with respect. 5. SLATHERING FOOD EARLY AND OFTEN WITH SAUCE A lot of people marinate raw food in barbecue sauce, because they're thinking, "Oh, I want barbecued chicken." Sugar burns quickly. You want to make sure that the inside of your food is done and juicy at the same time that the outside is browned. It takes 45 to 60 minutes to grill bone-in chicken pieces and only 5 to 10 minutes for sweet barbecue sauce to set and caramelize. So brush your food with sauce at the end of the cooking time. 6. OILING THE GRILL GRATES This is one of my mottos: "Oil the food, not the grates." A thin layer of oil on the food holds in moisture. Many grilling authors tell people to take a rag or a paper towel, dip it in oil and coat the cooking grates of your lit grill with it. Number one, that is literally a torch waiting to be lit; that's a big fire hazard. Number two, oil has a very low smoking point; you only have to oil the grates once to know that the oil will burn instantly. 7. USING SUPER LONG TONGS People think the longer the tongs are the better, but the truth is the longer the tongs, the less control you have. Our wrists aren't that strong. If the tongs splay open too much (and a lot of them open to 12 inches or more), you can get a cramp from having to hold them closed. I use tongs like an extension of my hand. The best are 12-inch locking chef's tongs that don't open more than six inches. 8. PLACING FISH DIRECTLY ON THE GRILL When fish skin scorches on the grill it can give the fish that awful fishy flavor (just think if you opened a capsule of cod liver oil and burned it). One my favorite ways to make salmon is to take a deboned, skin-on side of salmon and cook it at 325°F indirectly on a wet, water-soaked cedar plank. I like that temperature because it's really important to me to get a nice crispiness-- good color on the outside, still juicy and perfectly cooked on the inside. Because it's sitting on the wood, you can very easily slide your spatula between the flesh and the skin, and it'll easily come off, leaving the skin on the board. 9. COOKING RIBS UNTIL THEY FALL APART Pick up the ribs and give it a bend: If it's nice and flexible but not springy or rubbery, then it's generally done. If it falls apart immediately, then it's probably overcooked. 10. BUYING THE WRONG CUT FOR BRISKET A lot of people cook only the flat or the lean part of brisket, which often comes out tough and dry. You always want to cook the whole muscle. A cross-section of a brisket would reveal three parts: Two pieces of muscle (one called the flat or lean, and one called the deckle or point) and a fat cap. People should go to their butcher or their grocery store and say, "I want a whole, untrimmed brisket." The butcher will say, "Oh, no you don't! Here, you want this nice trimmed brisket." You tell the butcher you know what you're talking about, and that you want the whole fat cap on it, because that will keep the meat moist and protected during the long, slow cooking time.